Travellers on the Alaska Highway are stranded in a few Yukon communities due to road closures in two locations from washouts, flooding and mudslides. 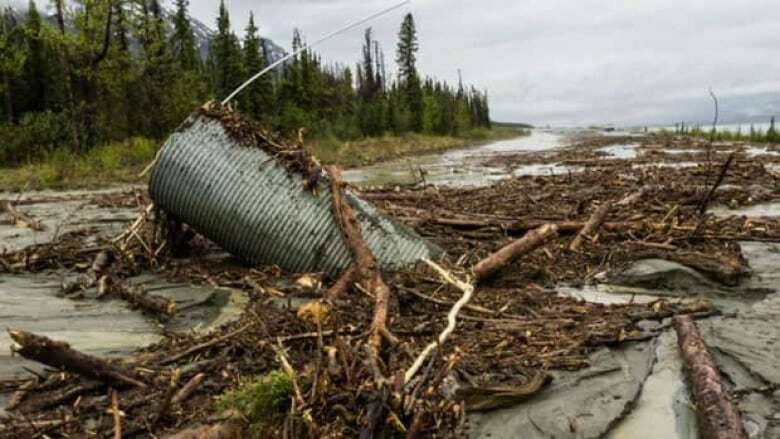 In western Yukon, the Alaska Highway is closed between Haines Junction and Destruction Bay because of a washout at the south end of Kluane Lake. Kelly Wroot, who lives just a few kilometres away wasn't able to get to work in Destruction Bay this morning because of the conditions. "The road is washed out, it's quite the mess," he said. "It looks like maybe a culvert got wiped up and it's just been kind of overwhelmed by the water. The culvert has actually been pushed up at about 45 degrees to the road sticking up in the air and the downstream side of the road is pretty washed out on the shoulders and there's a lot of debris in the road." In southeast Yukon, the Alaska Highway is closed between Teslin and the junction with the Stewart-Cassiar Highway due to high water and flooding in the Rancheria area. People are stranded at Rancheria, in the middle of one of the most affected areas, with washouts on one side and a mudslide on the other. Mary Eckle was on the night shift at the Big Horn Hotel in Watson Lake, and said it was "very hectic" as stranded travellers searched for a place to stay. "I came at 12 o'clock and we were all full and I had to turn people away because we were just absolutely full," she said. "All the hotels in town were full." On the other side of the affected area in the southeast Yukon, travellers are also waiting in Teslin. American Caroline Huggins got the last room at the local motel. She even invited four strangers to share the room last night because they had nowhere to go. Huggins said the road closure is frustrating, but she's looking on the bright side. "I didn't get in the slides, so I'm grateful," she said. She said because it's unclear when the road will re-open she has booked a spot on the Alaska ferry to take her down the coast. A spokesperson for Canada Post says its customers in Destruction Bay, Burwash Landing and Beaver Creek will not receive mail today due to the washout near Destruction Bay. Normal mail delivery will resume once the highway has been reopened.